On September 22nd at 1pm, the chain link fence around the Artesian Commons park came down in a mobilization of over 100 people. This action was taken to reclaim the space since its indefinite closure by the City of Olympia on August 24th. A month passed and the city has indicated no interest in ever opening the space again. 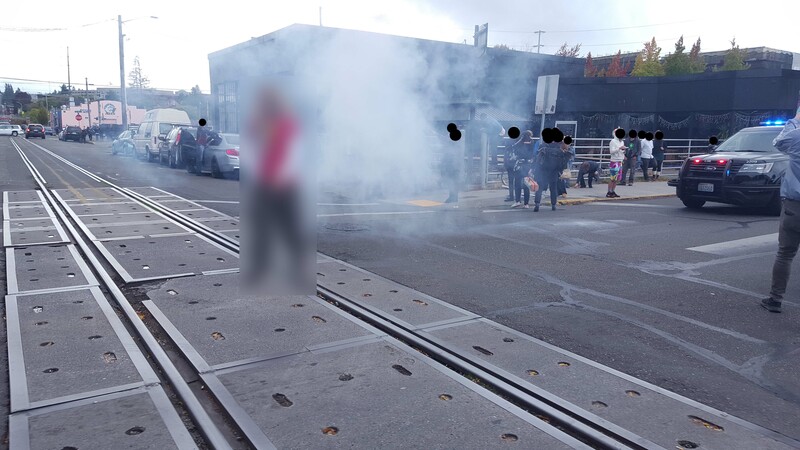 The closure of the Artesian Commons was toward the beginning of an escalating campaign to thoroughly clear the houseless from the Olympia downtown area. It started with the increased enforcement of the “no sit/no lie” ordinance including multiple arrests. It then escalated further with the attempted eviction of 3 camps in a downtown warehouse district that included over 60 tents. Many residents of this camp are physically disabled and rely on these camps especially due to their proximity to services. This eviction was delayed largely due to a threat from non-profit service providers to no longer work with the city. These service providers are at capacity and such a massive displacement would go far beyond their abilities to support the camp residents. Then both the eviction was cancelled indefinitely and no sit/no lie enforcement was ended indefinitely by the city after a Ninth Circuit Court of Appeal decision declaring certain camping bans as unconstitutional under the 8th Amendment clause against “cruel and unusual punishment.” In fear of legal action from groups such as The National Law Center on Homelessness & Poverty, The Homeless Rights Advocacy Project, and Columbia Legal Services these cancellations and slacked enforcement have stood for now. Since the cancellation, the camps have expanded to include even more people and tents. Two of them have roughly doubled in size. Another action included tabling in front of the closed park with radical literature. There was was also a sit in on the sidewalk that lasted much of the day and ended in the evening. It provided a space for buskers to play music to raise money for bail funds as well as place for people to simply exist in. 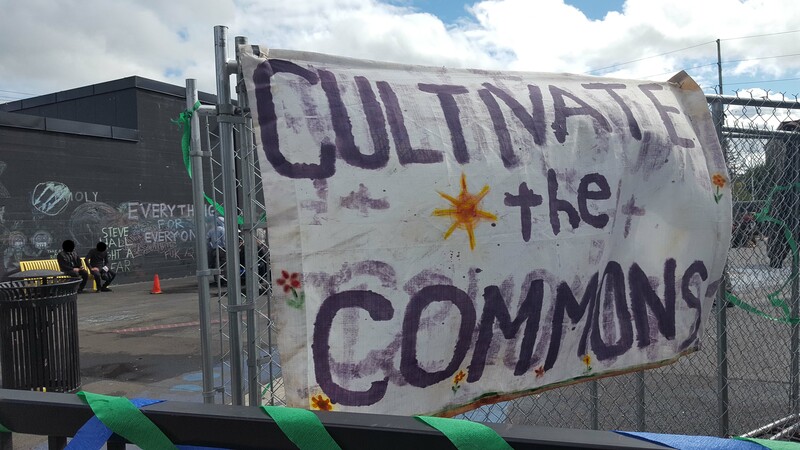 There was sign making, food sharing, and weed smoking. The event ended that evening when a conflict with the manager of The Clipper ended in the spilling and tracking of traffic striping paint as well as a call to the police. All of this was leading up to the city hall meeting on September 11th. This was the first meeting since the closure of the Artesian Commons 18 days previously. The sharp escalation in houseless displacement seemed to be timed by city staff to take place during this city council meeting hiatus to give them as little control of the process as possible. There was also a rumor out of City Hall that the no sit/no lie ordinance would be repealed based off of past support against the laws from some members as well as a confirmed vote from one. A march down 4th Avenue to City Hall of around 50-60 people preceded the meeting. At City Hall, a group of around 100 houseless and housed people showed up in opposition of the camping ban, no sit/no lie, and the Artesian Commons closure. But there was also another 100 people at City Hall for and against the “Missing Middle” which is a rezoning campaign primarily involving local home and land owners. This issue took up the majority of the meeting with no houseless issues even on the agenda. After close to 3 hours of deliberation on mostly the “Missing Middle” a motion to repeal no sit/no lie was proposed by Renata Rolins and seconded by Jim Cooper, but two supporters being relied on refused to support it. A second motion by Rollins to repeal the camping ban was not seconded. Lisa Parshley, who had come out against both of these laws previously, did not support the motion. Another city councilor, Jessica Bateman, said she would support these motions, but pulled out a couple of hours before the meeting started. Eleven days after this meeting and the utter disregard for the downtown houseless community by the City Council, the Artesian Commons was unofficially opened to the public. Once again, the space was being used by the larger community for its intended purpose. The park was strewn with banners and ribbons, the walls and ground were drawn on with chalk, there was music and singing and many played basketball on the court in the park. There was also a free hot meal made available by Olympia Food not Bombs. The event was heard on police dispatch 10 minutes after its start. Two hours after it started, around 3pm, a group of a dozen riot cops formed a line and gradually pushed us out the back gate of the park. Thirteen police vehicles and over 30 police were onsite. Pepper balls were shot into the crowd. Two were arrested at this point. One was charged with alleged misdemeanor trespassing. The other is being charged with 3rd degree felony assault on police which appears to be a complete fabrication according to multiple witnesses of the arrest. After being pushed from the park, the group moved to 4th Avenue, which was closed by police at the time. Park rangers then proceeded to reconstruct the temporary fence and replace padlocks on the permanent gates. The group was eventually forced off of the street by concussion grenades and pepper balls. Once the street was cleared, the police completely left the immediate area. As a result, the temporary fence was immediately disassembled and damaged again. The police returned shortly after to keep people out of the park so that park rangers could again assemble the fence, but this time with chains and locks holding it together. Concussion grenades were thrown at individuals on sidewalks next to the park where there was also a dog. The dog began shaking uncontrollably and did so for minutes, even as its owner comforted it. Two targeted arrests of individuals was attempted, but only one succeeded. The arrested person has been charged with 3rd degree felony assault on police. The street was again cleared with concussion grenades and pepper balls, but this time many police remained inside and around the fence for the rest of the day. After things seemed like they may be calming down, the police arrested someone allegedly involved in a fight. Another person was also beaten by police and arrested in front of the Well for an unknown reason. The community, primarily the houseless community, is bracing for repression due to this event. The police have already noticeably increased the intensity of harassment according to some who live on the streets downtown. Focus by the police is still largely on the Well, but many fear they will more intensely turn their attention to the camps and houseless folks when they stop. Bracing for this reality is an immediate concern, but the struggle to free the Artesian Commons is not over.